I swear I feel I was JUST saying, Goodbye January, Hello February and yet here I am saying Goodbye February, Hello March. I’ve really enjoyed getting to meet new bloggers and to see so much creativity in one place. 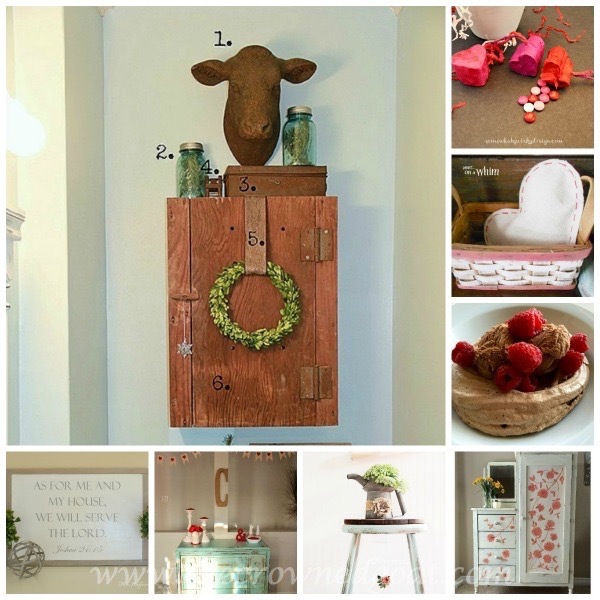 Here are a few of the amazing posts that have been featured by The Crowned Goat this month. It’s also been another hectic month painting. I gave this small dresser a makeover in Duck Egg. 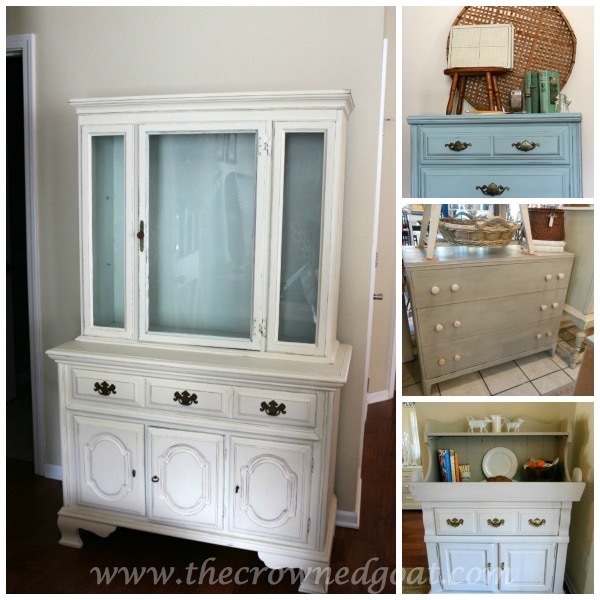 I painted the body of a china cabinet in one of my favorite colors and used a custom mix on the inside. I painted this dry sink with Valspar’s Lambs Wool back in December and was finally about to post about it this month. I also gave this vintage dresser and mirror a makeover in Annie Sloan’s French Linen with white wax. I was hot on the treasure trail picking up new inventory. 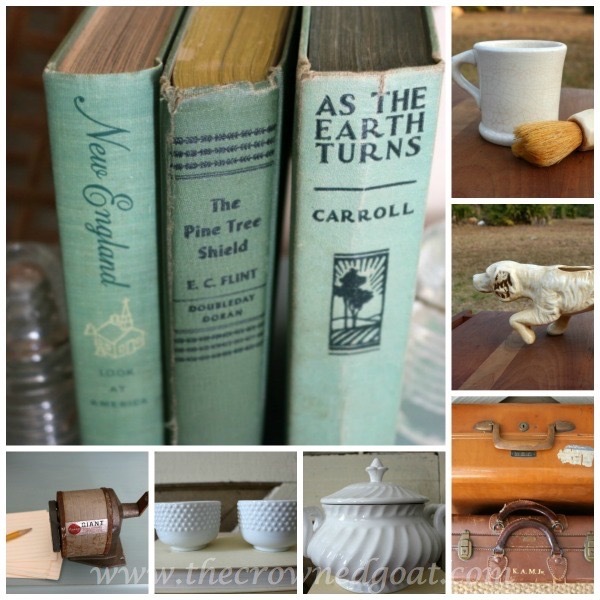 I shopped an amazing estate sale with my mom and picked up these items. I found all of these goodies during my trips around “the loop.” Here are a few of my favorites. 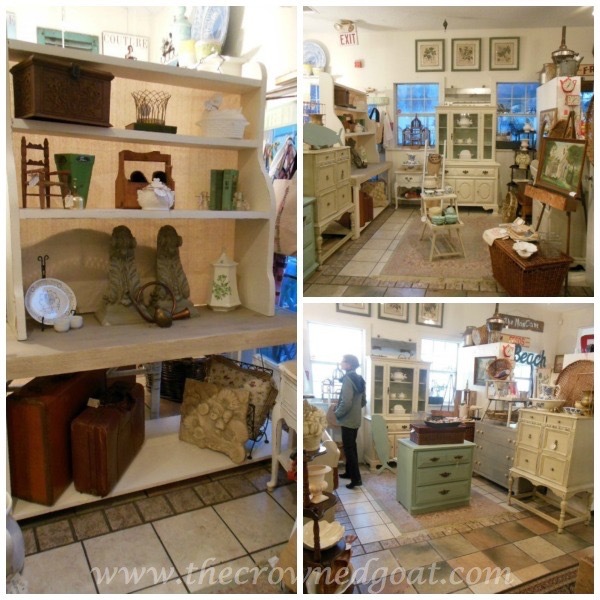 February also found me rebuilding my booth at The Pickers Market after really exciting sales in January. S built me this display unit so I could have a stationary piece for seasonal vignettes. It seems like the booth went through a lot of changes. 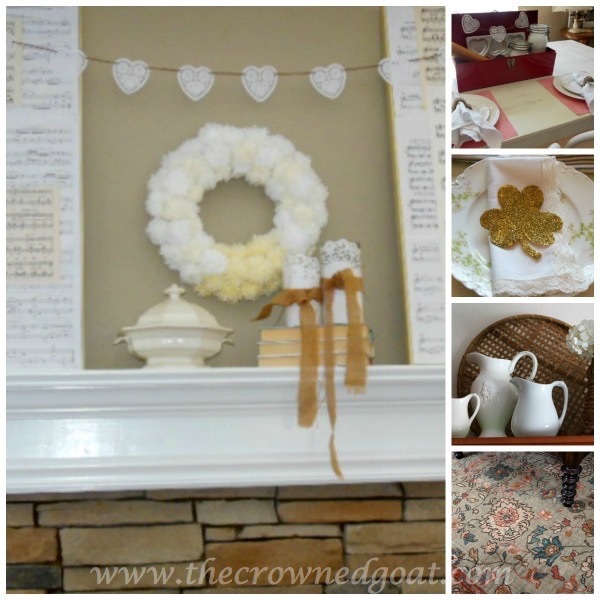 At home, I enjoyed a look back at last years Valentine inspired mantle and St. Patrick’s Day Inspired tablescapes. I revealed how I decorated the tops of my kitchen cabinets and shared my struggle to find 3 new rugs. It wasn’t all work though. 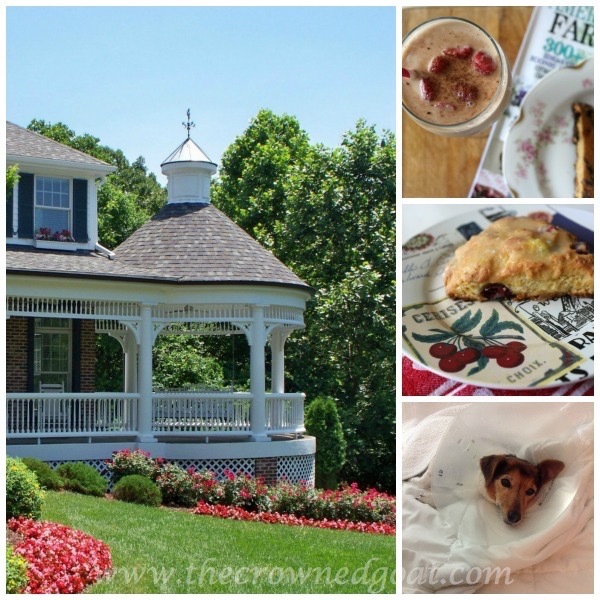 My friend, Kimberly Clair shared her heart for romantic living and her home with us. I shared my recipe for Raspberry Iced Coffee, cranberry orange scones and snuggled up with my pups on Valentine’s Day. My sweet Jelly Bean had emergency surgery following an eye injury. It was a scary experience but her vet and his team were fantastic. I am happy to report she is on the mend. We rounded out the month with a warm welcome for this sweet little pumpkin. 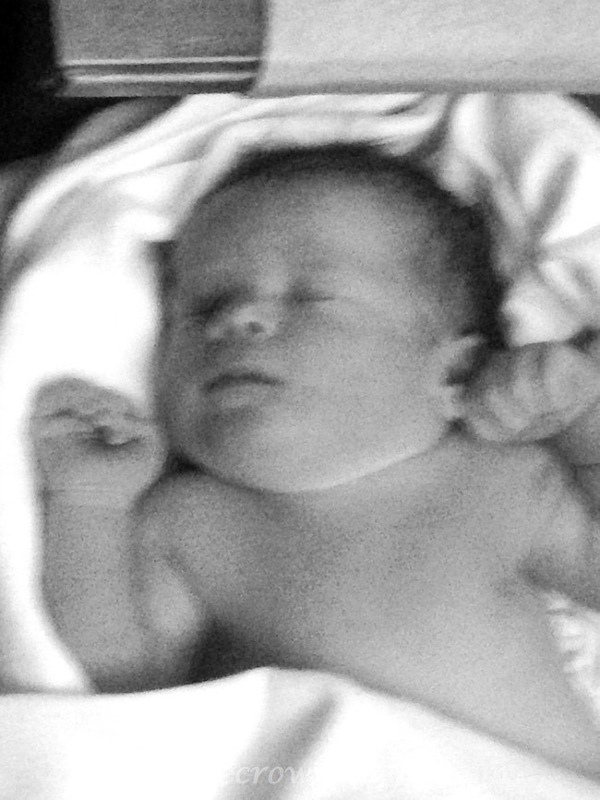 He was born just early Wednesday morning and brings my Aunt CoCo count up to 4! Goodbye February, it’s been fun. March, if you’re listening, I can’t wait to see what adventures you have in store for me! Girl…you have been busy!! What a great glimpse back at February! Isn’t it fun to see what you’ve accomplished in that amount of time? I loved the trip down memory lane…I’ve had the time of my life!